SMART Recovery For Alcoholism: Does This Program Work? Alcoholism is a disorder, and many people believe there is no effective treatment available for it. But with a treatment program such as SMART Recovery people struggling with alcohol disorder can achieve a long-term success of alcohol sobriety. The SMART Recovery program is a choice, and it depends on an alcoholic sincere desire to get help. Self-empowerment is the key focus of the program, and support resources such as meetings offer information on staying motivated after rehab. This helps prevent cravings and encourage the importance of living a life that is well balanced. What is the difference between SMART Recovery And 12-Step programs? What is the program of SMART Recovery? What is the scientific bases pf SMART recovery? Is SMART Recovery a right choice? SMART is an abbreviation for Self-Management and Recovery Training. It is a support program and self-empowering approach to recovery for people with behavioral disorders and addictions. It helps and teaches friends, family members, and individuals how to control their addictive behavior and move on with their lives after rehab. SMART Recovery tools and techniques are constantly updated based on scientific research. The techniques and tools are taught in SMART Recovery meetings to offer strategies that are found most effective by researchers to help an individual make a healthy life choice. This international non-profit organization was incorporated as Alcohol and Drug Abuse Self-Help Network (ADASHN) in 1992. But it started operation in 1994 under the name SMART Recovery. Since its inception, it has grown steadily and now provides more than 2200 local meetings in many countries around the world. The program has been endorsed by Federal Bureau of prisons, NCHCQR (Australia), National Institute on Drug Abuse (NIDA), SAMHSA, National Institute on Alcohol Abuse and Alcoholism (NIAAA), NDCP, NICE (UK), American Academy of Family Physicians (AAFP), EAPA, and ASAM. 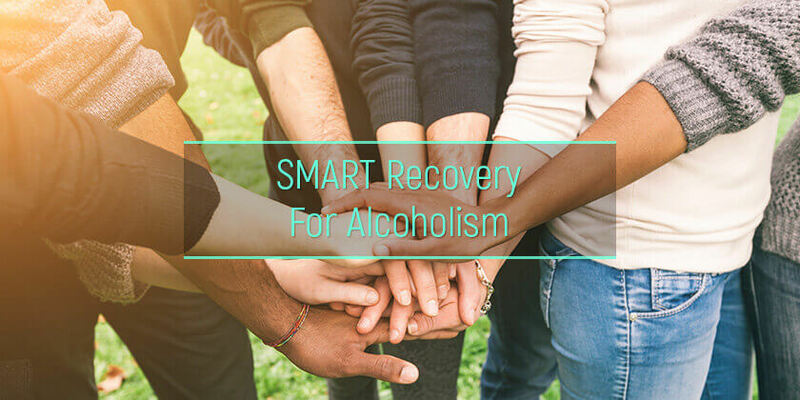 Even though both programs consist of recovering drug and alcohol users, the methodology of the SMART Recovery program and how it defines addiction makes it different from the 12 steps of AA. Alcoholic Anonymous (AA) adopted a spiritual approach that requires an individual participating to acknowledge powerlessness over their habit. But on the other hand, SMART uses cognitive-behavioral therapy techniques and motivational interviewing principles. SMART believes addiction is a choice and thereby disagrees with the disease theory of addiction. The methodology of this program is based on scientific knowledge. As scientific knowledge evolves, this recovery program also intends to evolve. Unlike the AA that offers twelve-step programs, SMART Recovery programs teach participants self-reliance to control their addictive behaviors by following a 4-point program. The 4-point program is detailed in a SMART Recovery handbook which also provides exercises and tips to maintain a sober life. Also, the SMART Recovery is not a step program. It gives participants the opportunity to tackle a particular point based on their needs and in any order, and this is one of the things that make it different from other alcoholism treatment options. Building motivation and maintaining it – One important part of achieving a long-lasting recovery is by having the proper willingness to stay sober. An individual who is participating in the program may create a list of priorities and weigh the benefits and cost of making use of the program against being sober. Coping with urges – This point takes a careful look at what stimulates alcohol and drugs craving. SMART Recovery groups teach participants how to suppress cravings. It can be achieved by using methods such as distraction techniques. Also, participants identify fallacious beliefs about urges to use alcohol and overcome them. Manage thoughts, feelings, and behaviors – At this point, participant learn how to stop relapse from happening by taking a close and careful look at behaviors, feelings, and thoughts. Each participant in a SMART Recovery group learns how to understand and accept oneself and also how to cope with difficult feelings like depression. Live a life that is a balance – To achieve a successful recovery, participants need to live a sober life and making this decision is a drastic lifestyle change. Here, the SMART Recovery training helps teach participants how to set goals that are realistic and plan for the future. The practices and principles of SMART Recovery are based on clinical experience and research. The technique centers on how to change emotions, thinking, and actions that are self-defeating. It also revolves around how to improve the quality of life of an individual participant without relying on alcohol and drug addictive behaviors. The program makes use of tools and techniques backed by science and that are practical within the SMART mutual-help model. The techniques include Cognitive Behavior Therapy (CBT), motivational interviewing, Rational Emotive Behavior Therapy (REBT), and other areas. CBT is an addiction or alcohol therapy that helps people with behavioral issues such as substance abuse, depression, and anxiety. On the other hand, REBT is therapy or practice that places value on discussing and adapting to how participants think and also changing beliefs that are irrational. Behavioral changes are encouraged by using motivational interviewing. It helps participant explore and resolve uncertainty. A journal of medical internet research published about the effectiveness of SMART Recovery in July 2013. One hundred eighty-nine heavy drinkers were recruited for the research and subjected to the recovery program. The result showed that there was a significant increase in their percent days abstinent (PDA) and a decrease in their alcohol-related problems and drink per drinking day (DDD). This indicates that the SMART Recovery is effective in helping an alcoholic addict recover from their addiction. A study titled Getting SMART, SMART Recovery Programs, and Reoffending, was published in the Journal of Forensic Practice. It is one of the most significant evidence of the SMART Recovery effectiveness. More than 5000 prisoners with significant alcohol and other addiction problems were enrolled in Getting SMART and SMART Recovery program and studied between 2007 and 2011. The study found that the combination of SMART Recovery and Getting SMART contributed to the reduction of violence by 42%. Also, Getting SMART contributed to violence reduction by 30%. Even though there are not enough studies to declare the program an evidence-based treatment, some studies have shown that SMART Recovery is effective. The program was established to help people suffering from any form of addiction. SMART is beneficial to people struggling with alcoholism, process addictions, behavioral disorders, and drug addiction. Also, the program can be a good choice for people having mental illness and substance abuse disorder by helping with dual diagnosis treatment. SMART Recovery is a good alternative if an individual has tried other recovery programs such as 12-step programs and found them unhelpful. An alcohol addict who admits to having a problem and needs help can get assistant and treatment from rehabilitation centers for alcoholics. Also, a scientific evidence-based recovery program such as SMART can assist alcoholics in feeling self-empowered, developing strategies to help participants beat cravings and avoid relapse. Alcohol addicts can attend SMART Recovery online meetings or at any location near where they reside. Even though many SMART Recovery groups may accept donations, meetings are open to anyone at no cost. AlcoRehab » How to Receive Alcohol Treatment That Works for You » SMART Recovery For Alcoholism: Does This Program Work?